Looking to purchase a new mattress near San Francisco? Check out our recommendations below. Though the city occupies less than 50 square miles, there are over 100 places to buy a mattress in San Francisco, from specialty stores, to factory outlets, to all-in-one furniture and mattress retailers. Buying a mattress in San Francisco represents a big investment in terms of money and space, and when folks here consider giving over room in their tiny apartments to a new mattress, they want space-saving options, along with the best possible quality. Accordingly, there are a number of places to buy compact mattresses (futons, murphy beds and loft beds), along with many local mattress stores selling all-natural, handcrafted and top-of-the-line products. Fortunately for shoppers on a budget, there are also quite a few places to buy an affordable mattress in San Francisco. If you’re wondering where to buy a mattress in San Francisco, look no further. We’ve combed the reviews to find the most reputable, most attentive, and most affordable mattress shops in the city, all sorted by geographic area. Read on to learn where to buy a mattress in San Francisco right in your own neighborhood. There are very few mattress stores in San Francisco based in the heart of the city, where corporate buildings, restaurants and boutiques make such a space-consuming enterprise impractical. One place to buy a mattress in this neighborhood, though, is Tokyo Futon and Tea (924 Valencia St). This charming boutique sells antique Japanese furniture, imported housewares, and tea, along with authentic tatami mattresses and futons. Customers can choose traditional roll-out shiki futons or western-style futon beds. For space-conscious San Francisco apartment dwellers, these beautiful and high quality Japanese mattresses are an attractive choice. Over to the West, Essential Sleep – Natural Mattress & Bedding Gallery (1601 Irving St) has further high-quality offerings. As the name implies, this mattress shop specializes in natural products, with natural mattresses made from palm fiber, cotton, latex, and wool. Essential Sleep features alternative and European brands like OMI, Chattam & Wells, Natura and Eclipse. Many of these natural mattresses can be built to order, and every product in the showroom is certified non-toxic by third party testers, including GOTS, GOLS, Oeke Tex and Certi-Pur. If you want to know where to buy a mattress in San Francisco, look to the North. This area of the city has the greatest density of mattress stores, from basic and affordable mattresses to high-end products. McRoskey Mattress Company (1687 Market St), founded back in 1899, specializes in top-of-the-line, handmade mattresses. Customers rave about the comfort and sleep-promoting qualities of these locally-crafted mattresses, which one reviewer calls “not a mattress but an express magic carpet to slumberland.” Mancini’s Sleepworld (2950 Geary Blvd), on the other hand, is a great resource for known brands, such as Tempur-Pedic, Aireloom and Sterns & Foster, along with the company’s own line of more affordable mattresses. Customers frequently praise the store’s highly trained sales associates. Store clerks here are willing to spend time guiding customers through an in-depth selection process, or simply help them get in and out as quickly as possible. Another multi-brand retailer in the area is Sleep Number (2675 Geary Blvd). This chain mattress shop carries a wide selection of brands, and specializes in mattresses and beds with adjustable firmness and support. This mattress store is especially popular with customers with special sleep needs, such as back pain, sleep apnea, and snoring, and couples who have different firmness preferences. Still another area chain with a selection of leading brands is Mattress Firm, the nation’s most popular mattress store. This giant chain has no less than five locations in the area: Mattress Firm San Francisco (1415 Van Ness Ave), Nob Hill (1600 Van Ness Ave), Richmond District (4801 Geary Blvd), Inner Richmond (4550 Geary Blvd), and Laurel Heights (3100 Geary Blvd). The vast majority of mattress shops in San Francisco are concentrated in the north of the city. You won’t find as many choices in the southern district, but there are a couple of places that do stand out. Both sell mattresses along with furniture, making them great resources for folks who are relocating and need to furnish an entire apartment alnog with their new mattress. The first is Zozi’s Loft (1920 Ocean Ave), which sells cute furniture and a limited selection of mattresses. Customers praise the store for great quality, good selection and reasonable prices. The Futon Shop (2150 Cesar Chavez Street) is the area’s other noteworthy furniture and mattress store. Customers here like the retail space’s relaxed vibe and highly responsive customer service. The Futon Shop products are all locally manufactured with eco-friendly ingredients, and many if their mattresses are even fully organic. In addition to futon beds and traditional shiki futons, the store sells platform beds, bedding, and natural furniture. Like The Futon Shop, KEETSA Mattress of San Francisco (68 Division St) is a green and local business. This mattress shop scores big points with customers who have sleep problems and are willing to invest in a high-quality mattress made with eco-friendly materials, including hemp, cotton and recycled fiber. Like KEETSA, The Natural Mattress Store (1243 Sutter St) is a California chain specializing in mattresses made with non-toxic materials, particularly organic cotton, wool and latex. Nest Bedding (367 9th St) also sells all-natural mattresses and bedding, manufactured in the USA. At both Nest and Natural Mattress, customers who value health and the environment report satisfaction with their high-quality products, along with great in-store customer service. For those who value saving space, Roomax (1355 Fitzgerald Ave) is located close by. This furniture store specializes in locally made, space-saving pieces, including Murphy beds. Further to the west, Duxiana (1803 Fillmore Street) delivers the area’s most sumptuous mattresses options. DUX beds, as the company’s luxury mattresses are called, are priced at a median of $13,000. Devotees swear that the price tag is thoroughly justified by the incomparable quality. 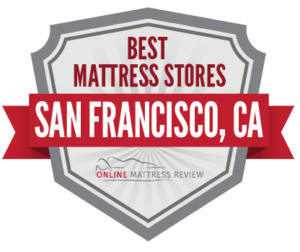 Many reviewers swear that these premium mattresses are the most comfortable, durable, and sleep-promoting mattresses in San Francisco. Continuing the eco-friendly trend, Essential Sleep (1601 Irving St) is yet another natural mattress store in San Francisco, this one located further to the West, in the neighborhood of Inner Sunset. Customers give props to Essential Sleep for knowledgeable, attentive and low-pressure sales associates. For those who want the security of shopping at a well-known, reputable department store, Macy’s Furniture Gallery in the Stonestown Galleria (3251 20th Ave) sells a number of top-brand mattresses, such as Beautyrest and Serta. Macy’s has been around since 1858 and operates 669 department store locations; customers can shop with confidence at this reliable retail giant, and can also pick up bedding, furniture, and housewares in the same trip. Finally, Alladin Rugs and Mattresses (2001 Clement St) is ranked the #2 place to buy a mattress in San Francisco by Yelp users, right after Mattress Firm. This local, family-owned mattress shop scores big points with shoppers for personal attention, outstanding customer service, and highly affordable mattress prices. In fact, Alladin offers an impressive price-matching guarantee: if you find a lower advertised price, your mattress is free.